Søren Sørensen operates Ourselves Alone in Copenhagen, one of the most genteel cocktail establishments in Europe. It was our pleasure to sit down with him in Berlin on the eve of annual Bar Convent Berlin trade show, the largest gathering of bartenders on this continent. We first met Søren at Le Lion – Bar de Paris, in Hamburg. 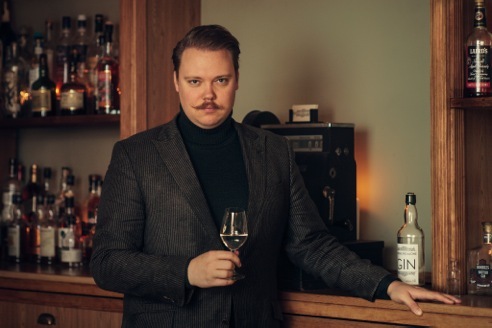 With his dashing sense of personal style and commitment to his craft, Søren represents some of the best the spirits and bar industry has to offer. How did you first get into making drinks? After breaking almost every bone in my body in a ski accident, I needed a job to make some money before going back to skiing professionally. I used to be a sponsored off-piste and freestyle skier back in the day, but after couple of crucial injuries, the bar looked pretty good. After a while I fell in love with it, and it reminded me a lot of the ski industry – it’s about the people, and there are a lot of great ones. Tell me something about Ourselves Alone. How did you know it was time to open your own place? Well I’ve always dreamed of opening my own bar. Now I have it, and I’m loving every moment of it! What’s the cocktail scene like in Copenhagen? And what is your favorite bar besides your own? It’s a fantastic scene. Picking one is hard, or even a couple, but I’ll say Salon 39 has a special place in my heart. What sets your place apart from the rest? I have to say I’ve heard exactly no complaints, only praise. I think whatever you are doing is working. Is that fair to say? Ah thanks. I’m happy that some people like us! I think the stuff that sets us apart is that we take service a bit further than the standard in Copenhagen. And we work with products regardless of the cost! Well, “working” is hard to quantify unless success can be measured by certain criteria. If success is piles of cash and stuff like that, no, it doesn’t work! But my success criteria are measured in life quality and in my bar and I believe my staff feels the same – and so do our guests, so it works for me. Tell me a bit about that mustache. It’s quite a breathtaking piece. Ha! Old bet with a friend in New York. I’ve had it for almost 4 years now. Do you favor any particular type of cologne? Helmut Lang once had a fantastic fragrance that I liked a lot. At the moment I blend my own in a shop in New York. Currently I’m sporting cedar wood, mandarin and juniper. What is your advice to upstarts in your industry? What particularly do they need to pay special attention to if they wish to succeed? Forget everything everyone tells you! I’m serious. It is possible. Just get it done. The key is to think for yourself and be happy. You’ve said your bar isn’t a speakeasy, but I assume you have house rules. Is there a door policy of any kind? Not really. The locked door is to control the number of guests we seat. We set our profile and mood so strongly that people never step out of line. We haven’t had issues yet. This year you were bestowed with some very special honors at the Cocktail Spirits Awards. Tell us about that. That meant the world to me! I normally don’t give much for “top” whatever lists and reviews and such. I’ve seen how it can attract the wrong people and change the atmosphere of a bar, but this specific list and barshow means the world to me. I feel like this is a pat on the shoulder from the people that I care about. And we partied a little after, I must say. Do you pay attention to trends at all in the cocktail game? If so, are there any that interest you in particular at the moment? Well I don’t really keep track any more. At the moment we are very much at balance with different products and so on. What does the future hold for Ourselves Alone? A Turtleneck Club gathering, obviously! That and we will just continue down this path. We are adding a few things soon like our kitchen and we’ll be serving awesome food.